As a rule, the past is lost forever. Try as we might to preserve it, remember it, relive it — things change. Usually that change is imperceptible; occasionally it’s dramatic. And once in a great while, when the mysterious causes and conditions that shape our lives are just right, the past reappears in the present…. In the summer of 1981 I climbed my first “big wall” — a route of such length and difficulty that several days are required for the ascent, and success is never assured. 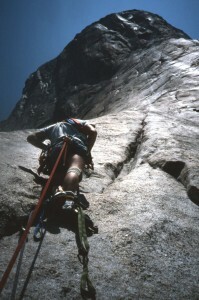 It was The Shield on El Capitan, which at the time enjoyed a reputation as a fearsome aid climb owing to the possibly irreversible Shield roof and a number of long pitches of very tenuous placements above. My partner and I completed the climb in five exhausting but glorious days. The nearly blank Shield headwall, where we spent a night in hammocks, and climbed the four most difficult pitches on the route, is probably the most remarkable spot I’ve been on planet earth. A smooth slab of rock, several football fields in size, split by a fingernail crack, perched 2,000 feet in the air…. Overall the climb was a great success, but not without its costs. We lost weight, skin, and quite a bit of expensive equipment. And we inadvertently left our cameras on the front seat of the car in the pitch dark of our early morning start. So I have only a single photo documenting possibly the greatest outdoor adventure of my life: taken low down on the route, while fixing ropes the day before. The next year an opportunity came along to rectify that loss. 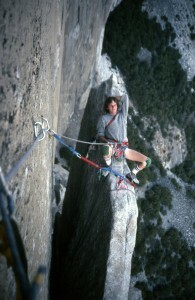 I had my sights on the classic Nose route up the central prow of El Capitan, only a few hundred feet from the Shield. 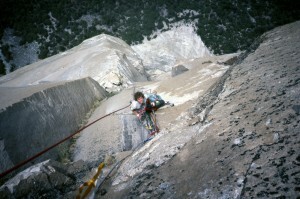 And I was fortunate to be introduced through friends in the Valley to another climber with similar ambitions. My new partner was a powerful and efficient climber with experience on long routes, and together we made a ruthlessly efficient team. We climbed the Nose smoothly in just two and a half days, success never in doubt. We both carried cameras and took plenty of pictures to document the climb and the remarkable landscape. 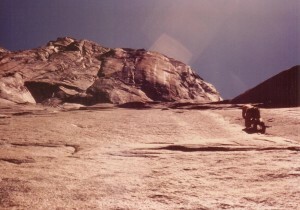 When I got home to southern California after the climb I had my photos developed, and was thrilled to finally have a photographic record of my time on El Cap. After viewing the slides, I put them in the mail to my partner, so he could duplicate them and send me his set. That was the last I ever saw of them…. As the weeks passed without any return slides in the mail, I finally got in touch with my partner. The details are fuzzy, but it seemed he, or a family member, had packaged his original slides with mine, and mailed them all back to me. Apparently they were all lost in the mail together…. A minor tragedy as human affairs go, but that loss hit me hard. Two big walls, two adventures of a lifetime, never to be repeated, and still I had no photos. I was 22. It was one of the major losses of my young life. Just stuff, memories, images, but it seemed larger than that. For the first time I experienced that wrenching feeling of something important being torn away, against my wishes, out of my control. I would come to know that feeling again in later years as friends, family, and time inevitably passed away. Perhaps the ensuing cautionary behaviors kept me safe over all these years, or perhaps they simply added to the anxiety of modern life. I’ll never know for sure. Thirty years passed. I got married, raised a son, had a career, retired, started a personal finance blog. In 2012 I wrote a guest post that related the factors required for big wall climbing success to those needed to achieve financial independence. 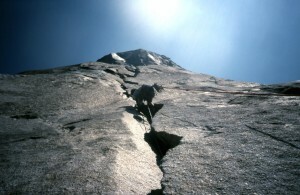 I used my single El Cap photo (shot while fixing ropes on the day before we launched up The Shield) to illustrate the article. Months later, an old climbing buddy saw that post and commented that he was glad my “long lost photos had been found.” I was shocked and puzzled by his comment. What was he talking about? My photos had never been found! What followed was the unraveling of a mystery: A tale of mutual acquaintances, chance encounters, fortuitous computer searches, long lost friends, and a dusty attic in Montana that produced the remarkable shots you see here — images I viewed just recently for the first time, more than three decades after they were taken in Yosemite Valley, on The Nose, in the summer of 1982. Postscript: Everything we experience is a lesson to be learned. And I learned to be less attached to photos, and other things, in later years. The ultimate lesson for me was perhaps that the photos were not “lost,” after all. My worst fears were unfounded. I just had to be patient.